how to make grill cupcakes! I wanted to share these super cute and (actually) quite simple grill cupcakes. They are perfect for a summer BBQ and will have all your guests in awe! Categories: Good Eats, Good Party | Tags: baking, cupcakes, grill cupcakes, Grilling, summer, summer party | Permalink. 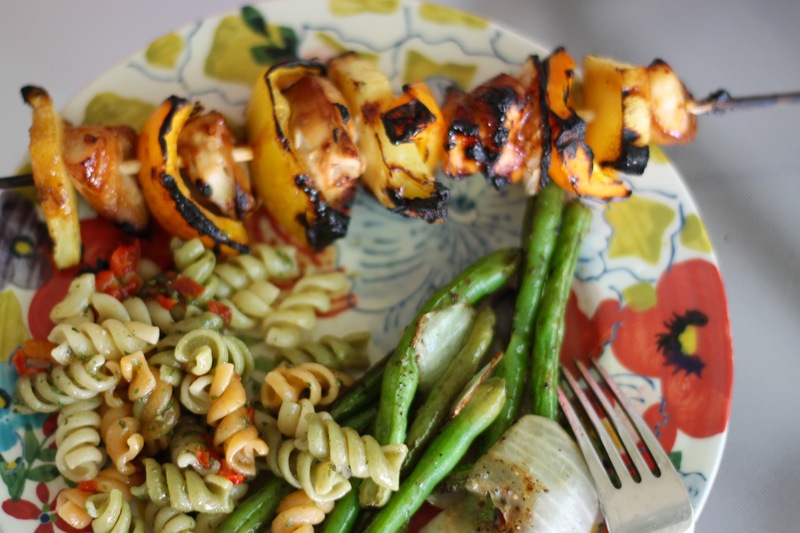 Here is an excellent and easy grilling dinner thats perfect for summer! 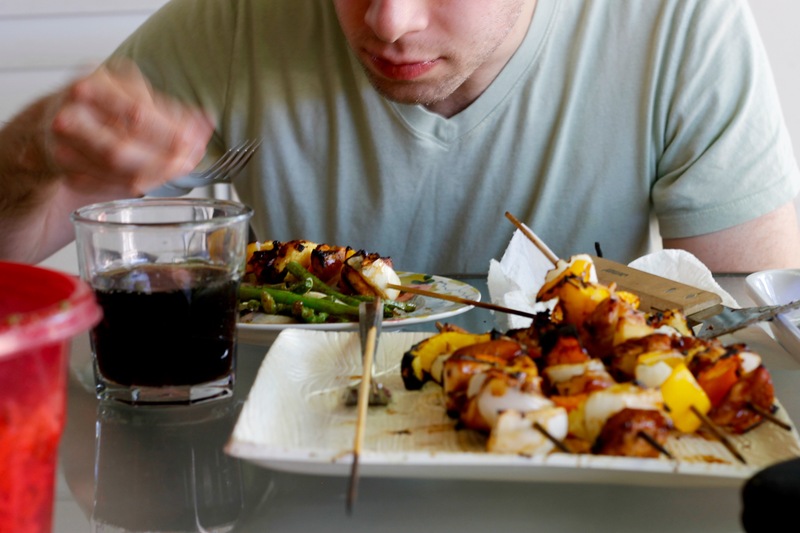 1) Soak wood skewers in a gallon ziplock bag of water for several hours before grilling to prevent them from catching fire while on the grill. 2) At least 30 minutes before grilling, marinade chicken tenders with 30 minute teriyaki marinade in a large ziplock bag. 3) Chop veggies in chunks where you will be able to easily able to skewer and have them not fall apart. I suggest having them fairly large. Cut tenders into about 4 chunks per tender. 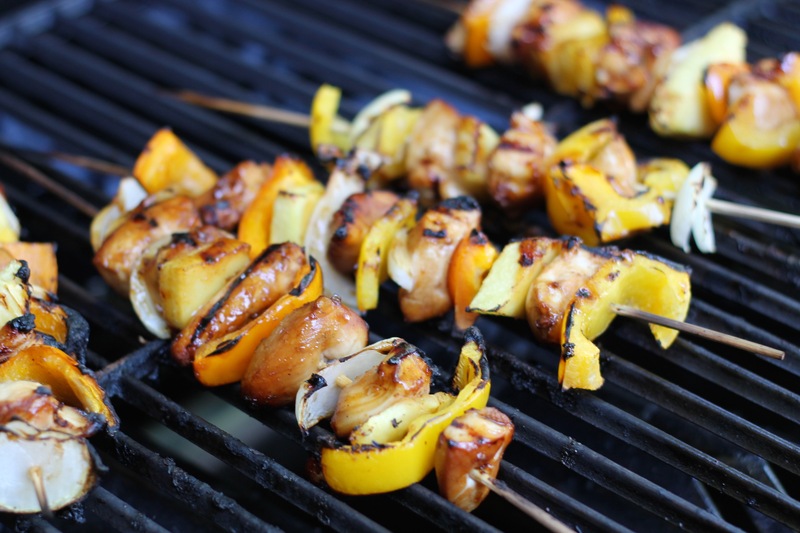 4) Place pineapple, onion, bell peppers and chicken alternating on the skewer. (I like to put the pineapple, bell pepper, chicken, onion, bell pepper pineapple chicken…just to have more fruit/veggie than chicken) It makes no difference which order or how many you place on the skewer. Just don’t pack them down too close where they can’t cook evenly. 5) Grill until cooked through approx 8-10 minutes, flipping once in-between. I served these with pasta salad and we also roasted green beans on the grill. 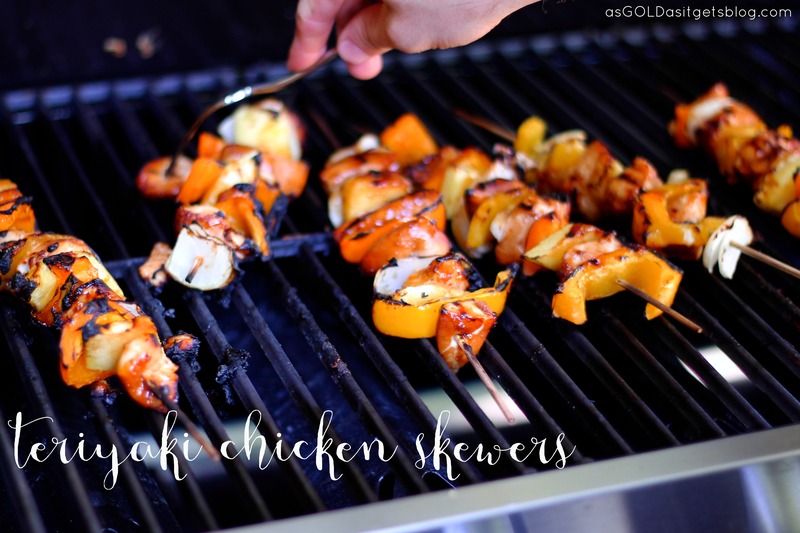 Categories: Good Eats | Tags: dinner, Grilling, summer grilling, teriyaki chicken skewers | Permalink. 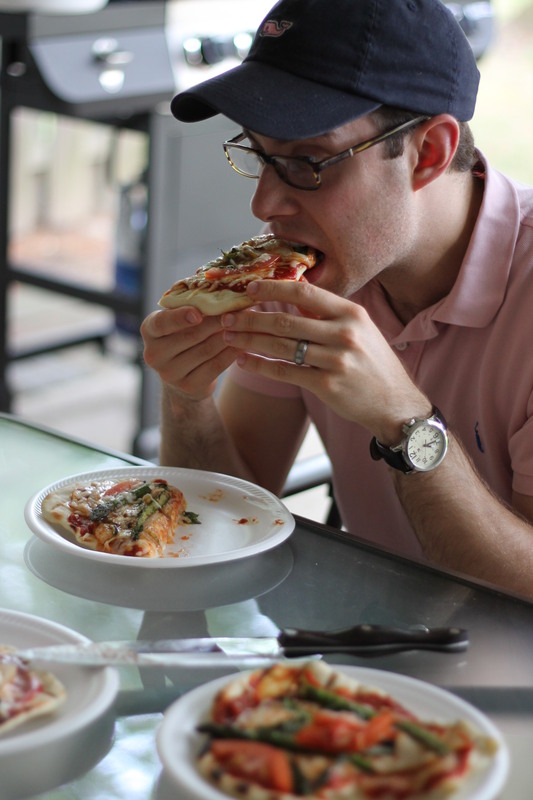 Friday nights in our house are known as Pizza Friday and we’ve been participating nearly every Friday since we got married almost three years ago (!!!!). We just love pizza. We mostly get it delivered these days, but when we were first married we nearly always made it because it was so budget friendly. 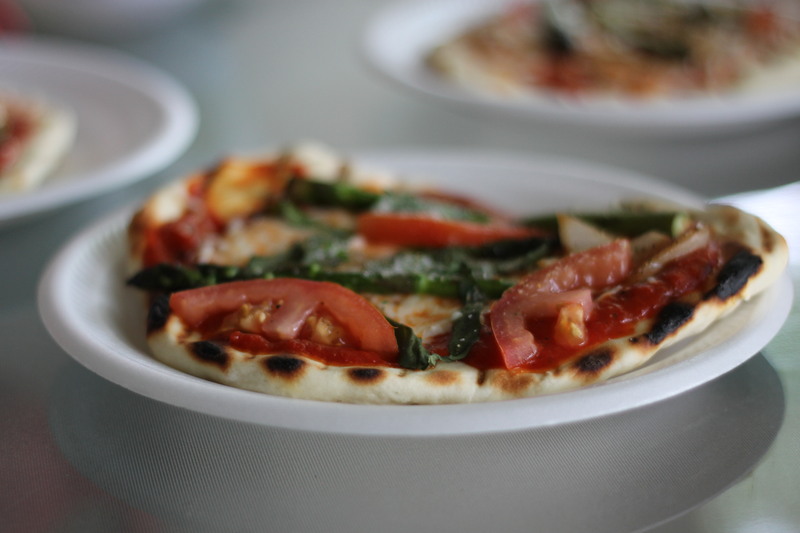 With our new grill we decided to give grilled pizza a try…and let me tell you it is amazing. I read a fair amount of commentary from frequent pizza grillers and found out that thin crust (like this one) doesn’t work well on the grill; you need something a little thicker. I found a recipe from Kitchn (also below) which says its the best for grilling…and these came out really perfect. Definitely utilize the fact that these are smaller pizzas. A larger pizza would be hard to flip and to get off the grill easy. 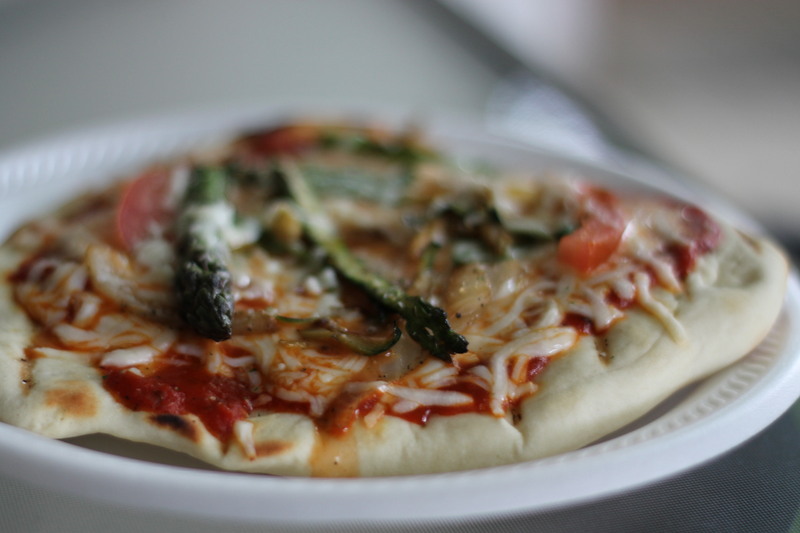 We used chopped tomatoes, zucchini, onion and asparagus on these. I grilled all the veggies except for the tomatoes in olive oil with some garlic salt and pepper in a pan before we moved outside. It’s really important to use have everything ready to go because these cook very fast. The pensive look means that the taste-tester approves! 1) Mix water and yeast in a stand mixer. Let sit until yeast is dissolved. 2) Start sautéing veggies in a hot skillet with olive oil. Sprinkle garlic salt and pepper for seasoning. 3) Once yeast is dissolved. Stir in olive oil, lightly stir to combine and then add in flour and salt. Using clean hands, mix lightly until the dough is “shaggy”. I suggest adding a sprinkle of garlic salt here. 4) Using the dough hook attachment, knead the dough on a low speed for 5-7 minutes. Dough should transform to be a smooth ball. 5) Using a butter knife cut the dough into 8 sections and roll each into a ball. Grease a baking pan slightly with olive oil and place the dough balls in the pan, rolling them where all sides are covered with the oil. Let them rise for an hour to an hour and a half, they should rise and double in size. You can use them immediately. Refer to the kitchn link above for more info about freezing and using later. 1) Let the grill heat up for 10-15 closed before starting pizzas. 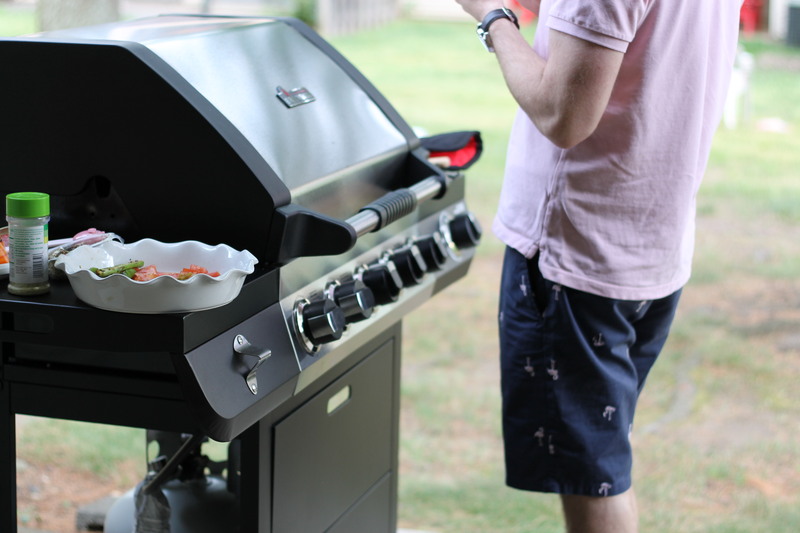 Reduce some of the heat on the grill – create an area of direct heat and of indirect heat. 2) Roll out dough and lay over direct heat on gas grill, close and let cook for 1-3 minutes, depending on your grill. You should be able to see grate marks on the dough. 3) Using tongs or grill-safe spatula flip dough and place uncooked side over indirect heat area. Immediately add sauce, cheese and toppings. Don’t overload it so it can cook evenly and you can efficiently remove from the grill. Close grill and let it cook 3-5 more minutes until the cheese is melted. Be sure to keep an eye on your grill temperature so it doesn’t scorch your pizza. It might not take that long to cook. 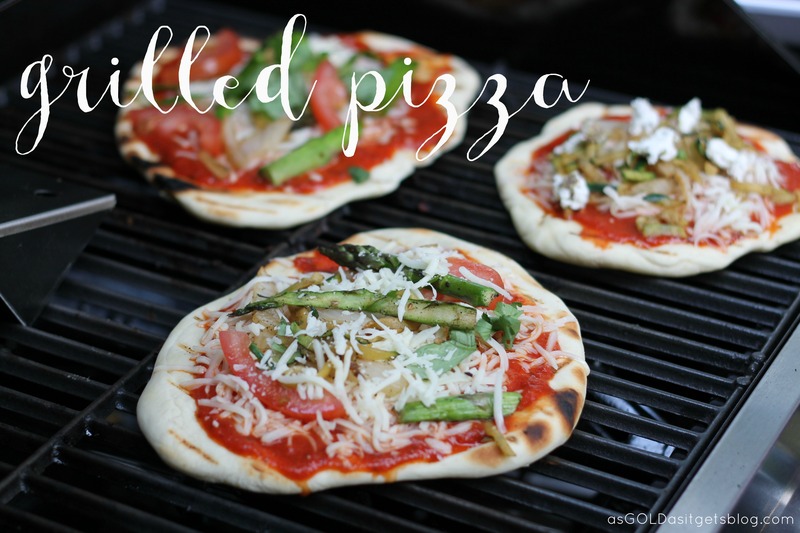 Categories: Good Eats | Tags: grilled pizza, Grilling, pizza, summer dinner | Permalink. 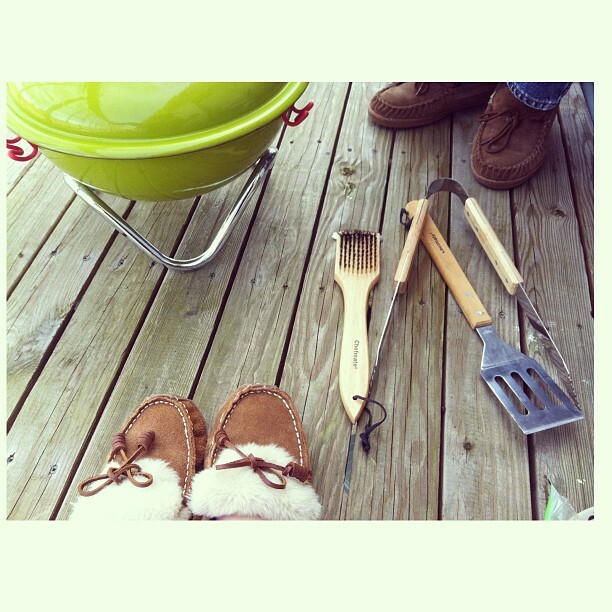 This past weekend we had a full weekend that included breaking out the grill. Now in our house that’s a scary thought…because no one is good at it. Last summer we got a grill as a wedding present and were really excited about it because it sounded fun. It was not fun, it was hard. JPS has zero experience grilling, so three hours in our food tasted like lighter fluid, which was not exactly the condiment I preferred on my hot dog. And then I had a grumpy husband. I’m happy to report that this year, JPS is the grillmaster and our food was awesome! I think grilling requires a certain patience that he didn’t expect. But he’s figured it out and it was delicious! I’ve been pinning some delicious things to make on the grill and am excited to be able to actually use it this summer! Do you have any great grilling secrets? Categories: Good Times | Tags: Barbecue grill, Grilling, Home and Garden | Permalink.